Do you like Sharko The Right Mix? Share it with your friends. 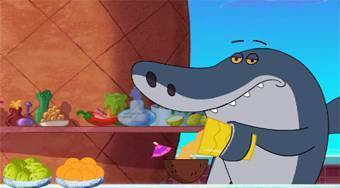 Sharko The Right Mix is a fun flash game where your task is to help a cute shark in the role of a bartender to make the most delicious non-alcoholic cocktail. You can choose from four kinds of fruit flavors. Choose two kinds of fruit, mix thoroughly, and then see how the shark tastes good.